The far infrared heating and infrared heating combination, wider application range. The conveyor belt is made of Teflon coating mesh belt (chain / chain plate of /PVC stainless steel net belt can be customized as needed), stable operation, variable frequency speed regulation, adjustable speed. The heating box adopts fault insulation technology (patent), safety and energy saving. The oven is the product drying, curing, curing, curing, heat shrinkable, heating, high temperature sterilization. 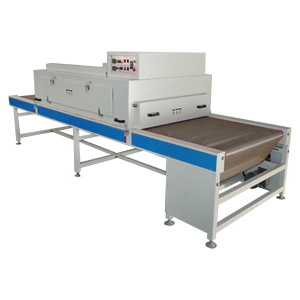 Such as electronic products, circuit board dampness drying, capacitor, transformer, glue curing, silicone baking, signs, labels, paper printing ink drying, curing. Glue, resin, LED conductive silver glue curing etc.. It can also be used for general chemical, pharmaceutical, leather, furniture, auto parts, motor coil, transformer, plastics and food, agricultural and sideline products, aquatic products, light industry, heavy industry and other fields of material baking.